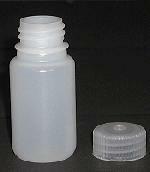 2 OZ Bottle - Used In Our Standard Size Refill Kits. Bottle With Leak Proof Top. Large Enough For Syringe.